How can we de-story the joint? Over the weekend I discovered the hashtag #destroythejoint on Twitter. It was started by Jane Caro in response to the sexist comments of well-known Australian radio presenter Alan Jones about women in politics. Caro issued an invitation to women on Twitter to state just how they were “destroying the joint” and comments rolled in. (For recaps see Caro here and Jill Tomlinson here.) Soon the tag started to trend, first nationally, then internationally. By the end of the weekend Caro was being interviewed by the BBC (starts 36:20). Men and women, on both sides of the political divide, grew vocal in protesting the misogyny of Jones’ comments. Twitter pictures abounded with remakes of old Stalinist-style posters inviting women to “destroy the joint”. 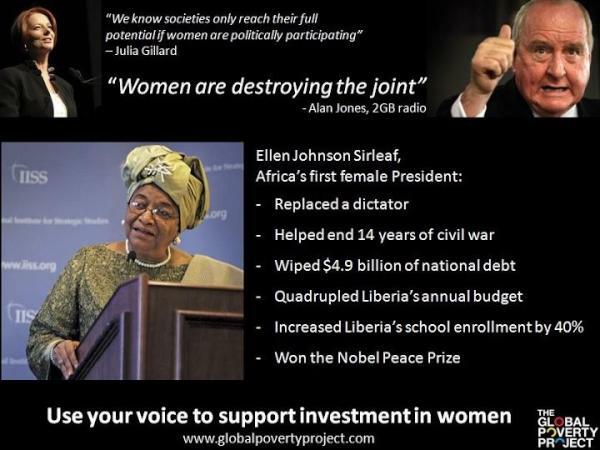 Examples of powerful women in politics, like Africa’s first female President, Ellen Johnson Sirleaf, were circulated. Other social media picked it up and a “Destroy the Joint” Facebook page was created “for people who are sick of the sexism dished out to women in public roles in Australia”. The energy and enthusiasm reminded me of the groundswell of protest that met a reviewer’s misogynist comments on author Tara Moss’s blog last year. Those negative comments led to the creation of the Australian Women Writers Challenge which, throughout 2012, has promoted reviews of books by Australian women for the National Year of Reading. To date, the challenge has generated over a thousand reviews of books by Australian women, and is set to continue in 2013 on a new AWW site (still in draft form, but a team is working on it). It’s a great example of how anger can be channelled constructively. I started to wonder, could something creative come out of #destroythejoint? As I followed and used the hashtag, I noticed how many times I kept mistyping “de-story” for “destroy”. I picked up other writers, including crime author PM Newton, doing it, too. The slip made me think. Do Australian authors – male and female – help to “de-story” the joint? Do they help to steer the discourse away from misogyny and antagonism, to create something which can have a lasting impact to improve our world? Their writing can, and does. But they need readers. They need Australian readers who recognise their names, just as they recognise prominent sports people. Why do we get a wrap up of five stories about sport on our national radio and no mention of writers and their achievements? Why is it expatriate novelists like Nikki Gemmel, Geraldine Brooks and Kathy Lette are still far better known in Australia than those living in our midst – fine, award-winning writers, like the crime writers who celebrated this weekend at the Sisters in Crime dinner in Melbourne at the Davitt Awards? So, if you had to think hard about when the last time you read a book by an Australian woman, maybe it’s time you checked out the AWW challenge page to see all the wonderful titles that have been read and reviewed this year. Let’s tell – and listen to – our own stories. Maybe then we can all help to de-story the joint and create real change. A though provoking post, Elizabeth. Love it. Great post, Elizabeth. If there was an arts roundup as well as, or better still, instead of, a sports rounduo, I might be persuaded to actually watch the news! Ha! Well, this was the radio, but I know what you mean. Thanks for dropping by, Annabel. As a guy, I have read ‘The Light between Oceans’ and ‘Foal’s Bread’. Alan does what he does. The trick is not to believe him. Have you reviewed either of these, Michael? ‘As a woman’ I’ve read Light Between Oceans, Foal’s Bread, Animal People, Five Bells & All That I Am this year. I’m still trying to get through The Man Who Loved… Oh and I’m currently re-reading The Getting of Wisdom. There’s probably others but this is because I’ve made an effort to read more Australian stuff not female Australian stuff and it just happened that this year there’s been a bit of it which is great. Nice article Elizabeth, thank you.